I made a diagram for you ladies to help you understand where i place my shadows. 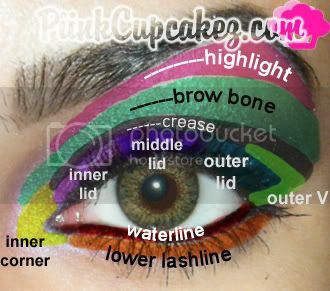 applying eyeliner to your upper waterline is known as "tightlining"
any colors can be added here..
Great post! I'll try this..
Wow! You are using a lot of eye shadows at once! You are so sweet for thinking of other divas. Thanks for posting this. Your one of my favorite Divas! This is great hun, really helpful! LMAO @ your "THIS IS NOT A LOOK"! lol, girl, if anyone wore this like a look, I'd love to see! Very helpful! :D Thanks for sharing! a man i anted to try nd rock this look lol. great post. when people ask me wat i mean i will direct them here! I love this, can I post this on my blog? That was extremely helpful! Thank you! I posted it on my blog and I linked back to you :-). hat a great post !